Washington: North Korea's latest test of an intercontinental ballistic missile (ICBM) has shown that Pyongyang now may be able to reach most of the continental United States, two US officials told Reuters on Monday. However, two US intelligence officials, speaking on condition of anonymity, said on Monday Kim wants to develop a nuclear-capable ICBM to deter any attack on his country and gain international legitimacy, not to launch an attack on the United States or its allies that he knows would be suicidal. The Pentagon declined to comment on the US assessment of the missile launch, even as it acknowledged that the latest test represented the longest test flight of any North Korean missile. "The specifics of our assessment are classified for reasons I hope you understand," Pentagon spokesman Navy Captain Jeff Davis told a news briefing, acknowledging only that the missile could fly at least 5,500 km (3,420 miles), the minimum range for what the Pentagon classifies as an ICBM. Two separate US officials who discussed the latest test, which lasted about 45 minutes, said it showed greater range than the July 4 ICBM launch, which North Korea said lasted 39 minutes. CNN, citing a US defense official, reported later that North Korea had been showing "highly unusual and unprecedented levels" of submarine activity, in addition to its third "ejection test" this month. The ejection test was carried out on land at Sinpo Naval Shipyard on Sunday, the US defense official told CNN. It gave no other details about the increased submarine activity. A South Korea defence ministry official told Reuters the military was watching the situation in the North closely but did not provide more information because it was classified. Japanese Prime Minister Shinzo Abe spoke with Trump on Monday and agreed on the need for more action on North Korea, hours after the US Ambassador to the United Nations said Washington was "done talking about North Korea". The Pentagon acknowledged military-to-military talks with US allies Japan and South Korea after the test. 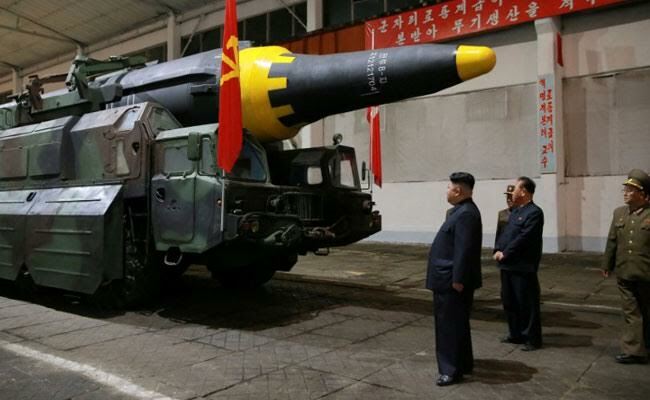 The Hwasong-14, named after the Korean word for Mars, reached an altitude of 3,724.9 km (2,314.6 miles) and flew 998 km (620 miles) before landing in the waters off the Korean peninsula's east coast, according to KCNA.